What sets OY Surf Apparel products apart is their ultimate functionality, quality and variety. The surf bikinis are a perfect fit, without having to compromise on design. The fixed and relieving cross on the back of our tops provides maximum wearing comfort for the accomplished everyday woman. The different bottoms we offer allow for generous coverage, but with practical strings that can be tightened according to the needs or taste of the individual, also allowing for optimum grip or release. With the many different products and a wide range of cuts and shapes, we offer the perfect fit for any body type and activity. Each product is also available in a variety of colors and patterns. OY Surf Apparel gives you a free range to mix & match as you please regarding cut, color and pattern. Although the label is surf culture oriented, OY Surf Apparel has also created various complimentary products such as leggings and tops, with practical cuts and combinations, yet simple designs for all our joggers and yoga girls out there. OY Surf Apparel provides best quality with every product including our sturdy and thick Lycra material. The robust material is hand processed, and, even under a heavy load of salt water, keeps its shape. The products will last even longer if hand washed. Since 2012 OY stands out for its quality, functionality, and flexibility with various combination options. This flexibility also applies to our business model, with the two founding partners, Regula Aebi (30) and Zelia Zadra (25), living at two different ends of the world. Regula develops, organizes, and produces the product in Bali, Indonesia, whilst Zelia designs the textiles, markets and distributes from Zurich, Switzerland. 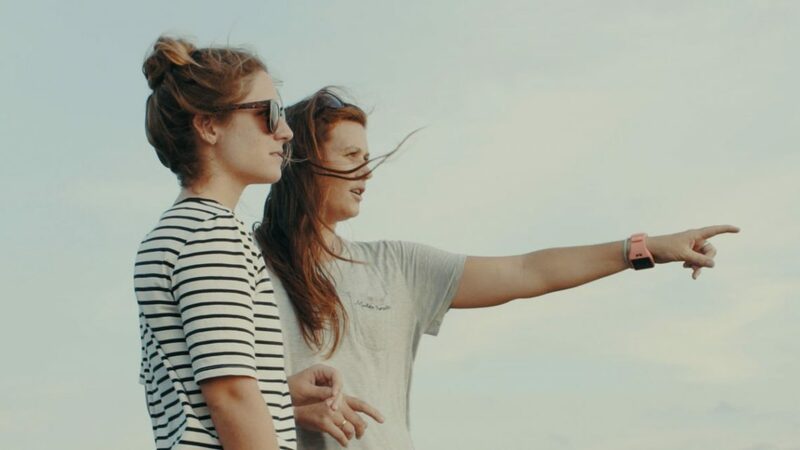 These two business women met on the waves of the Indian Ocean and to this day are connected by their mutual passion for surfing. The shapes and patterns of each collection mirror the simplicity of surfing’s origins rooted in nature, for the powerful women that want to enjoy inspiring, active, and carefree moments outdoors. OY Surf Apparel was founded in December 2012, and has supplied shops and clientele all over the world with their popular bikinis, leggings and Lycra- tops since September 2013.